Happy, Happy Friday! I have to admit this is one of my favorite times of year. When the days are just starting to get shorter, and you can just feel the autumn is coming. Even though I have not headed "back to school" in four years! FOUR Years! I still feel like this is the best time of year for new beginnings, to get a fresh start on things at work. A great time to really get focused and organized, which may happen to involve a new planner. It might seem strange, because its not the "new year" or anything, but for me its the start of a new meeting season. "Summer break" is over and its time to get focused. Totally loving my Maybook and getting organized! 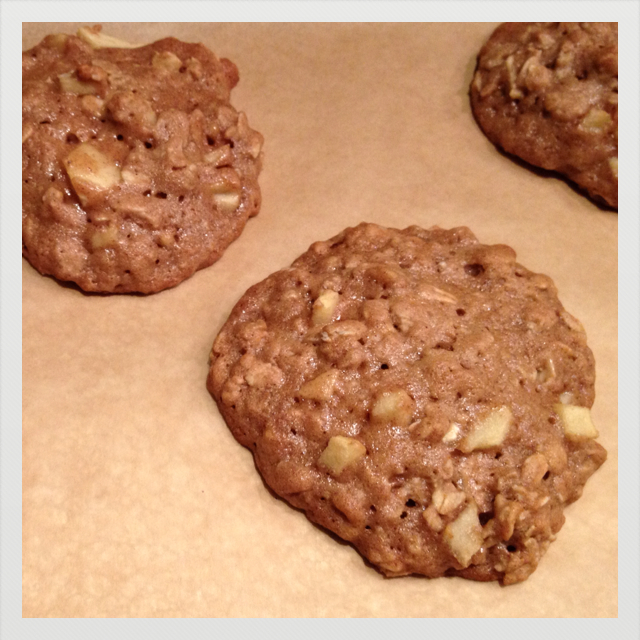 Or well you know, you make cookies...apple pie cookies that are soft, cakey and moist. The perfect cookies to start to welcome the fall. The apples stay slightly crunchy and the oats provide great texture. These cookies really taste like apple pie and once again I made them a bit healthier than how they started. These cookies are super easy to throw together and delicious. Enjoy! Honey, brown sugar and butter...cream together and spread on toast or a bagel? Okay, now I want a bagel, but cookies, apple pie cookies it where this is headed. Whisking and then just a bit of folding. A large heaping scoop...don't worry these cookies don't spread too much. 2. In a large mixing bowl, cream together butter, brown sugar and honey until well combined. 3. Then whisk in the eggs and vanilla extract. 4. In a medium sized mixing bowl, whisk together the flours, baking powder, cinnamon, nutmeg and salt. 5. In two additions, whisk the dry ingredients into the wet. Then fold in the oats and apples. 6. Using a cookie scoop or tablespoon, scoop dough on to cookie sheet approximately 1 1/2 inches apart. Bake for 10-12 minutes or until golden brown. Enjoy!